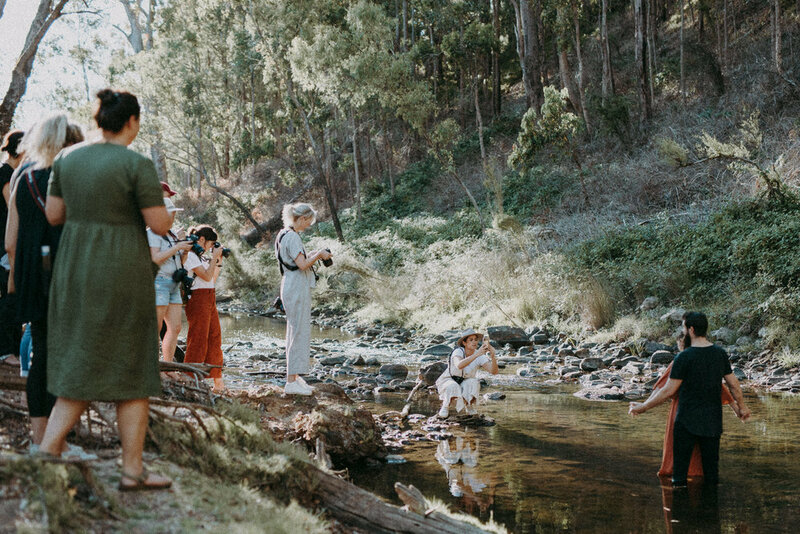 Our first event of 2019 saw us go all Hands On and head to Nanga Bush Camp for a day & night to hear from and see how some of the raddest wedding folk do their thing. James Simmons & Natasja Kremers showed how they do their thing with some couples shoots; Tyler Brown went over and showed how he rocks it when it comes time to shooting the bridal party (sorry if anyone got covered in champagne spray); & Sarah Tonkin showed how she keeps making everyone jealous of her insanely great styled shoots. Massive props to The Pretty Parlour for coming out and doing their magical hair and makeup thing on a devastatingly hot day; Through The White Door for supplying those awesome wedding dresses; Sir Botanical for her killer florals; Cora Aubrey & Jordy Stuart for modelling up a storm for everybody; our awesome couples that put their hands up to be shot in front of a large on-looking crowd (seriously, so good guys! ); and Carving A Giant for being the photographer’s photographer on the day and giving us all the gold you see below!